11.5mm (long) teardrop beads with three facets around the middle; the hole running the long direction. 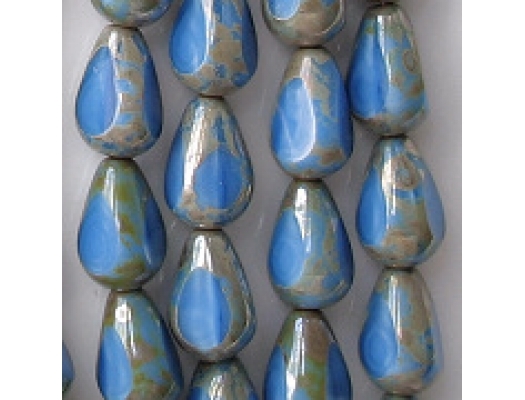 Satiny opaque blue with a mottled brown/gray luster "picasso" coating on the rounded portions of the beads. Most beads have one imperfect facet, which is a lot considering that each bead has only three facets. This is due to the fire-polishing process. The imperfect facet will be a little dull, or it will not be entirely flat, or both. I haven't lowered my price because of these defects. Imperfect facets due to fire-polishing just have to be accepted. If the beads were hand-polished, they would be twice as expensive. 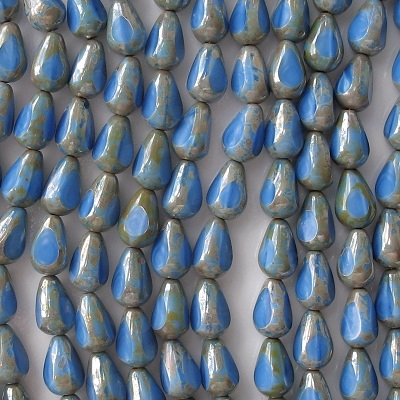 There's no doubt that these beads are unusual. 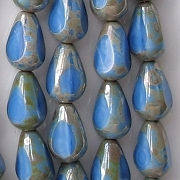 I haven't seen any other beads made out of this rich blue satiny glass. I feel very fortunate that the supplier has had them in stock for so long. Unfortunately, they are as expensive as the polished rectangles that I carry. When I restocked these beads in December, 2013, I was able to lower the price from 20 cents per bead to 16.8 cents per bead (but I also increased the lot size to 25, so the price-per-lot actually went up a bit). I was able to lower the price because I got the beads at a discount. However, the next time I buy them, there may be no discount, so the price will have to go up again.